The SB-500 AF Speedlight has simple controls—just a few buttons —and it operates on two AA batteries; yet, it offers the performance of an advanced Speedlight. Its powerful and has wide coverage with a guide number of 24/78.7 (ISO 100, m/ft) with 24mm coverage in FX-format and 16mm coverage in DX-format. Its head rotates 180° left and right and tilts 90° upward allowing you to bounce light off nearby surfaces to soften the light and shadows, creating more flattering portraits. If your camera has a Commander Mode, it can even be used wirelessly off-camera along with your camera's built-in flash for greater illumination power from interesting angles. The SB-500 AF Speedlight is also a versatile video light especially well suited for recording interviews up close. It has a built-in high-intensity LED light (approx. 100 lux) that provides steady, uniform daylight-balanced illumination. It can be used at three output levels—quarter, half or full power—making it practical for low-light video shooting and close up still photography. 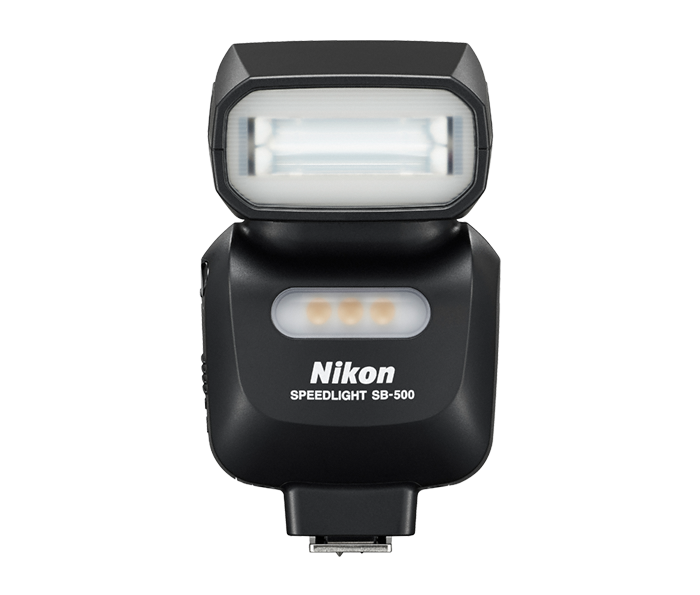 And when used with the D810 or D750, the SB-500 AF Speedlight communicates LED color information (along with that of the flash) to the camera for optimal white balance. Nikon's i-TTL technology (intelligent Through-The-Lens) tailors the characteristics of the flash to each shot you take, so you get optimal results every time. With that intelligence and more illumination power than a camera's pop-up flash, the SB-500 AF Speedlight is excellent as a fill-light outdoors (brightening shadowy areas on your subject) or for soft bounce lighting indoors. Use it off-camera wirelessly as a second flash controlled by either your camera's built-in flash (if your camera has a Commander Mode), another Speedlight or the SU-800 Wireless Speedlight Commander. If you're using D810 or D750 in Commander Mode, the SB-500 AF Speedlight will also work as a master flash in Advanced Wireless Lighting.